The Family That Shoots Together . . .
We spent the past week in Charlotte, NC visiting family. The occasion was to celebrate my father-in-law’s 90th birthday. Family came in from all over. An amazing number of them are, or have become in recent years, gun people. Besides my wife and the two of my three sons who were there for the occasion, there were four others who carry. One is a nephew from Florida, who some years back had a pistol stuck in face during a robbery. After my nephew handed over his wallet, the guy pulled the trigger. The gun, which was pressed up against my nephew’s nose, didn’t fire. Whether it was not loaded or it was a case of divine intervention, he never found out. But now he carries a Springfield XD and is very uncomfortable if the gun isn’t with him at all times. He flew to Charlotte and didn’t bring his gun, but we fixed him up with one of ours for the week. A sister-in-law and a close friend of hers asked me to take them shooting. I located a gun range nearby–Firepower, Inc. in Matthews, NC and we took a couple of 9mm’s and my mother-in-law’s 22 Caliber Colt 1911 and went shooting. The online reviews of Firepower, Inc. were mixed, with some alleging bad attitudes behind the counter, poor customer service, etc. Our experience was fine. We were treated courteously and professionally. The range was a nice one, with equipment very similar to my favorite range in Fort Worth–The Shooting Gallery. Firepower, Inc. is a gun store with a fairly good selection of firearms, all priced at what appeared to be MSRP. The girls did well with their shooting. I was a little surprised at their lack of experience since one of them was a farmer’s widow and the other has been married to a Vietnam era Army Special Forces guy for years. He has lots of guns, but for some reason she hasn’t done much shooting. 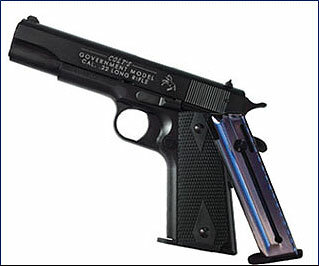 The 22 caliber Colt 1911 is an interesting firearm. My father-in-law described it as a “22 on a 45 frame.” He bought it in 1946 for home protection. I looked it up in the Blue Book of Gun values and if I’m reading everything correctly, its current value is somewhere around $4500. He probably paid less than $100 for it back then. Like all the Colts I’ve seen, this is a well-made firearm. The magazine is strong and solid, with a spring that made difficult to load. We fired some Winchester White Box through the gun and it handled it superbly. I asked my mother-in-law to pencil me into her will for that gun when she’s gone. I don’t know any other relatives that would be that interested in it. For me it would be to keep, not to turn into cash. This trip added some additional confirmation that people all over who didn’t previously think much about guns are thinking about owning some now. We sure do enjoy teaching them to use them safely and proficiently.